I've just added Myro's prize for winning Pop Quiz 6 to HandRight-Standard and HandRight-Female. 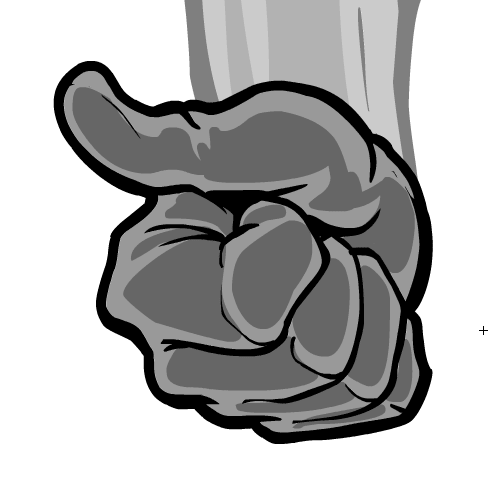 In addition, as long as I was in there I went ahead and added the side-view fist to HandRight-Standard as well. Note that the female thumbs-up is redrawn to look more feminine for hers. Getting the item masking right on this one was tricky, so let me know how items mask to the hands. 5 Responses to HM3: Thumbs up! Thumbs up on the artwork. Thanks, Jeff. I was thinking something more head on, but this still works. Thanks Jeff. I was thinking something more head on, but this still works.Thanks Jeff. Yeah, I went back and forth on that. Ultimately I thought this one would be more flexible, since it’s hard to put anything in the straight-on hand, which in itself would be almost the same as the straight-on fist. Jeff Hebert: Yeah, I went back and forth on that. Ultimately I thought this one would be more flexible, since it’s hard to put anything in the straight-on hand, which in itself would be almost the same as the straight-on fist. In that vein, I think I can also use the thumb from this with the straight-on fist to craft the hand I had in mind as well,if need be, so there is some versatility that way.